Christopher Davis tries to be invisible in middle school, but being small and smart, he’s still a target for bullies. Chris just goes through life until Mandy, his one friend, points out that his life would be better as a girl. In fact, Mandy believes that Chris’s true self is female. Chris has never thought he was transgender but medical tests prove that Chris is actually intersex, a genetic variation. With the support of his mother and Mandy, Chris begins the transition to living as Lauren. This includes going to school as a girl, dealing with classmates and teachers, making new friends, and discovering her truest self. A Transgender Young Adult book by Karin Bishop. I've had a hard time the past 15 years as my wife has developed an intimate relationship (BBFs) with another woman. Not lesbian, just super intimate. I've felt left out as their woman to woman BF relationship happens not just away from home but also right in front of me while I'm ignored, a ghost. I am angry and OUR marriage is in danger. In trying to understand thier relationship in an effort to improve our marriage, I'm reading a lot of girly books, including lesbian, male to female transformation, and even teen romance books like "In Concert". Though straight forward, not my crowd, and not my kind of readingI, I enjoyed the book because it gave me a look at teenage girl best friendships (BFs), which helps me understand my wife and HBF's relationship a little better. Wish me luck with my marriage. Not bad, but all of her characters are the "lucky one's" who look gorgeous after the transition. Further, she rarely has her characters tell their future dates, which seems dishonest. Would love to see her tackle a manly dude wanting to become a woman, deal with a little reality in her stories. 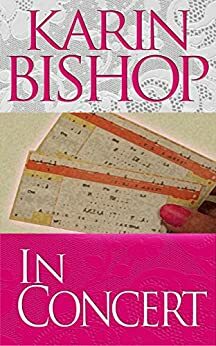 Yet another excellent book by Miss Bishop. I have read all her books, and have found no drop off in the quality of her writing. When reading this and her other books you can tell she truely cares about the characters in her books. this is a typical book of Miss Bishop's well research and super writing and if you enjoy stories of Transgender this a great story as most if not her stories are. Karin Bishop writes so well. Each and every book is a good read. Detailed and holds your interest. Well thought out and sensitive to every issue. Big, big fan of hers.